Description: Bushy perennial 10–20 cm high and up to 30 cm diam. ; branches white-woolly. Leaves ± spathulate, mostly 3–9 cm long, 10–25 mm wide, apex shortly acuminate to apiculate with a dark mucro, lamina flat, concolorous, grey-green, ± felty. 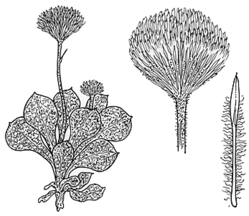 Scapes 2–15 cm long, terminal, woolly; heads broad-campanulate, 12–15 mm long; involucral bracts graded, inner ones longest; outer bracts scarious but with almost opaque straw-coloured erect to spreading tips, lower half woolly; innermost bracts herbaceous, pubescent with glandular hairs, with scarious woolly margins and short membranous laminas. Florets all bisexual, yellow, exceeding the involucre by 3–4 mm. Achenes oblong, slightly compressed, papillose; pappus bristles barbellate. Flowering: Flowers most of year but mainly spring. Distribution and occurrence: Grows in open low arid shrub communities on sandy sometimes rocky soil and on gibber plain often with underlying clay, sometimes on low ridges; in the Broken Hill to Sturt N.P. area. Other Australian states: ?Qld S.A. ?N.T.